Business Profit Graph PowerPoint Templates And PowerPoint Themes 1012-Create stunning Microsoft office PPT Presentations with our professional templates containing a graphic of success chart. This PowerPoint template shows the increasing graph with each letter of Success on each step. This template portrays the concepts of winning, leadership, finance, success, competition, sports, business, shapes, people and abstract. Present your views using our innovative slides and be assured of leaving a lasting impression.-Business Profit Graph PowerPoint Templates And PowerPoint Themes 1012-This PowerPoint template can be used for presentations relating to-"Success profit chart graphic, business, finance, success, money, marketing" Failsafe systems are difficult to design. 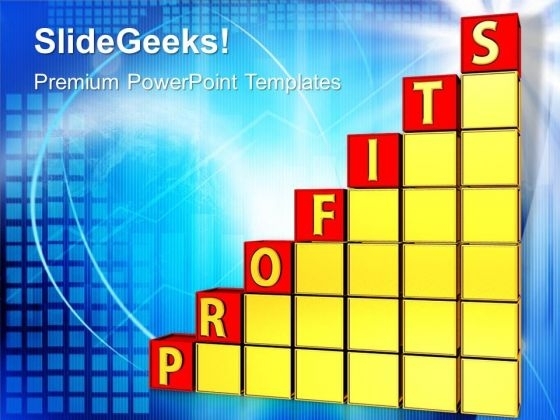 Get to the bottom of it with our Business Profit Graph PowerPoint Templates And PowerPoint Themes 1012. Our Business Profit Graph PowerPoint Templates And PowerPoint Themes 1012 are able architects. They give concrete shape to your ideas. Profit Chart Success PowerPoint Templates And PowerPoint Themes 1012-The above template displays a diagram of a profit chart with percentages on tab. This image represents the concept of business success. It is a useful captivating tool conceived to enable you to define your message in your Business and Marketing PPT presentations. Go ahead and add personality to your presentations with our high quality growth business chart template.-Profit Chart Success PowerPoint Templates And PowerPoint Themes 1012-This PowerPoint template can be used for presentations relating to-"Success profit chart graphic, business, finance, success, money, marketing" Our Profit Chart Success PowerPoint Templates And PowerPoint Themes 1012 ensure an admirable address. The audience won't be able to fault your ideas. Our Profit Chart Success PowerPoint Templates And PowerPoint Themes 1012 are designed for authenticity. They do not encourage any farce.